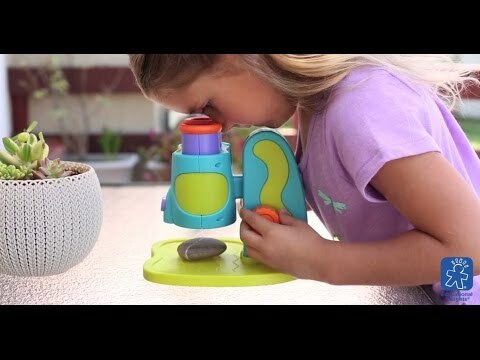 Fully functional microscope designed especially for little hands and easy understanding. The chunky design is easy-to-use and can be viewed with both eyes using the two large rubberized eye pieces, eliminating the need to close one eye. Has an oversized knob for simple focusing and the LED light enhances viewing of small details on the fixed stage, with no slides required. Perfect as a child’s first microscope, has 8x magnification and all images cleverly appear left-right correct for easy understanding. Install a love of science and explore the fascinating hidden mini-world all around us. Box Size: 10" x 7.5" x 6"